Question 1 What is an electric motor? Question 2 On what principle does electric motor works? Question 3 Explain the construction of electric motor? Question 4 Give commercial use of electric motor? Question 5 Give uses of D.C. motor? It is a device which converts electrical energy into mechanical energy. The principle of the electric motor is based on the fact that a current carrying conductor produces a magnetic field around it. A current carrying conductor placed perpendicular to magnetic field experiences a force. (1) Armature coil: It consist of a single loop of an insulated copper wire in the form of a rectangle. (2) Strong field magnet: Armature coil is placed between 2 pole pieces of a strong magnet which provide strong magnetic field. (3) Split ring type commutator: It consist of 2 halves of a metallic ring.The two ends of armature coil are connected to these 2 halves of ring.Commutators reverses the direction of current in armature coil. (4) Brushes: Two carbon brushes press against the commutator.These brushes act as contact between commutator and terminal battery. (5) Battery: It is connected across the carbon brushes.It supplies current to the armature coil. 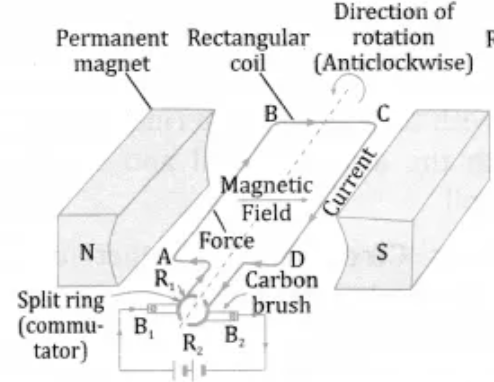 1)In the side AB of the rectangular cil ABCD, the direction of current is from A to B and in the side CD of the coil, the direction of current is from C to D.The direction of magnetic field is from N pole of the magnet to its S pole. 2) Applying Fleming’s Left hand rule to sides AB and CD of the coil, the force on side AB of the coil is in downward direction whereas the force on side CD of the coil is in upward direction. Due to this the side AB of the coil is pushed down and side CD is pushed up.This makes the coil ABCD rotate in the anticlockwise direction. 3) While rotating, when the coil reached vertical position, then the brushes will touch the gap between the two commutator rings and current of the coil is cut off. Though the current to the coil is cut off when it is in the exact vertical position, the coil does not stop rotating because it has already gained momentum due to which it goes beyond the vertical position. 4) After half rotation, when the coil goes beyond vertical position, the side CD of the coil comes on the left side whereas side AB of the coil comes to the right side, and the two commutator half rings automatically change contact from one brush to the other. 5) After half rotation of the coil , the commutator half ring R2 makes contact with brush B1 whereas the commutator half ring R1 makes contact with brush B2.This reverse the direction of current in the coil. 6) The reversal of direction of current reverses the direction of force acting on the sides AB and CD of the coil.The side CD of the coil is now on the left side with a downward force on it whereas the side AB is now on the right side with an upward force on it.Due to this the side CD of the coil is pushed down and the side AB of coil is pushed up.This makes the coil rotate anticlockwise by another half rotation. 7) The reversing of current in the coil is repeated after every half rotation due to which the coil continue to rotate as long as current from the battery is passed through it. (1) Electromagnet in place of permanent magnet. (2) A soft iron core on which coil is wound. It is used in electric cars, rolling mills, electric cranes, lifts, drilling machine, fan, hair dryers, blowers, tape recorder, refrigerators, washing machine, mixers, blenders. yaah really its too much amezing site.. This is a helpful site indeed. really impresed with class notes , as it makes D.C ‘s explation quiet easy.and language is simple as-well…………. It’s great…it helped me in exams…. I could easily understand about electric motor . Thank you for the lovely explanation. Very nice notes i like it very much !!!!!! !